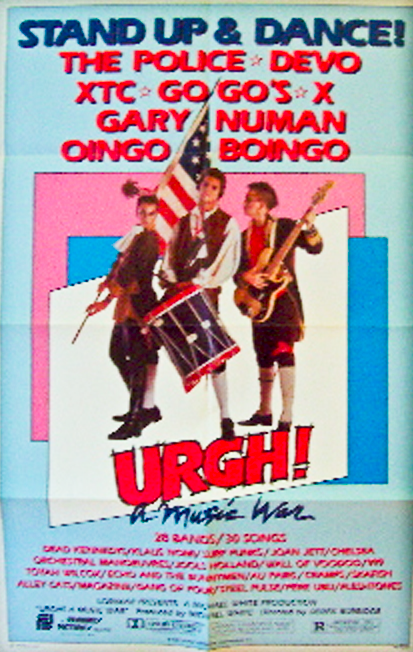 Here’s some unexpected news: The legendary punk/new-wave concert film Urgh! A Music War was released yesterday on DVD via Warner Archives. (Thanks to Shiv for the tip.) Up until now, you could only get the flick — which featured performances from Echo & the Bunnymen, OMD, XTC, Devo, The Go Gos, The Police, X, Klaus Nomi and more — via bootleg DVD (or, if you could find it, on VHS or by watching it when it aired occasionally on TV). The CD and vinyl versions of the soundtrack are even rarer (and more out of print). And yes, I do have a copy on vinyl.